I am big fan of Pandora. It's what I listen to when I'm blogging, catching up on magazines, or cooking. Sometimes, we listen to it in the car (Thank you, Sprint, for unlimited data!) and we stream it when we're simply sharing space at home. I have a dozen channels, more or less, that I listen to fairly regularly, but I have my favorites. Here are some of the channels that make up the soundtrack at our house. Winter's coming...I couldn't help myself. I love the acoustic sounds of Jason Mraz. His feel good, romantic tunes, like on my favorite YES cd, are laid back and folksy. People who like Jack Johnson or Ed Sheeran will love this channel. From classical guitar to Rodrigo y Gabriela, this toe-tapping channel will have you yearning for a ticket to Spain before your first track has finished. When I'm missing Paris, I listen to Edith Piaf. With French language classics sung by Piaf and classic crooners like Charles Aznavour, you will get your fill of French inspired accordion loveliness, plus an occasional bossa nova or samba for good measure. My Parrothead roots run deep, and when I'm reminiscing about my time living in South Florida and my time exploring the Florida Keys, I queue up all things Buffett. I'm back on island time faster than you savor a shot of tequila. Fins up! There is something about a trumpet that is intensely romantic. I have seen Chris Botti live and he does not disappoint. This channel features Botti classics, peppered with the great Winton Marsalis and Miles Davis. Perfect for a weekend afternoon on the couch with a book and a blanket. 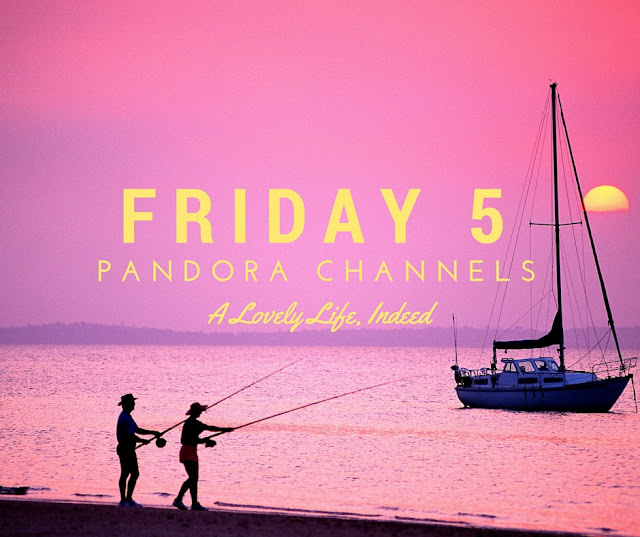 So those are my go-to Pandora channels. Who are you listening to these days? What is your happy music? Thanks for introducing me to the 5 channels. As far as music, I have my favorites. But you open up some of new channels for me. I am willing to try them. They will be re-visited by me during the weekend. I have Jason Mraz too. If I want relaxing music I go to Ray LaMontagne or Citizen Cope. The only one that is NOT on my list is Mraz, as I do not know him..will check it out! Thank you!! Agradecida. These look like pleasurable picks Kelly- though I've had such a draining- busy- though filled with many special moments month of October and am in such great need of a break- some time to get back to writing- and to just be able to listen to some music! I love Jason Mraz...he reminds me so much of Jack Johnson; that soft acoustic sound. Enjoy! I love Ray LaMontagne too; such a soulful voice. I have never heard of Citizen Cope. Going to check them out. Thanks! What are your favorites, Stella? I hope you enjoy these. I love Pandora because I can listen to anything, even instrumental versions of modern music, in case singing clashes with your creative process. I hope you find a break and some quiet time, Peggy.